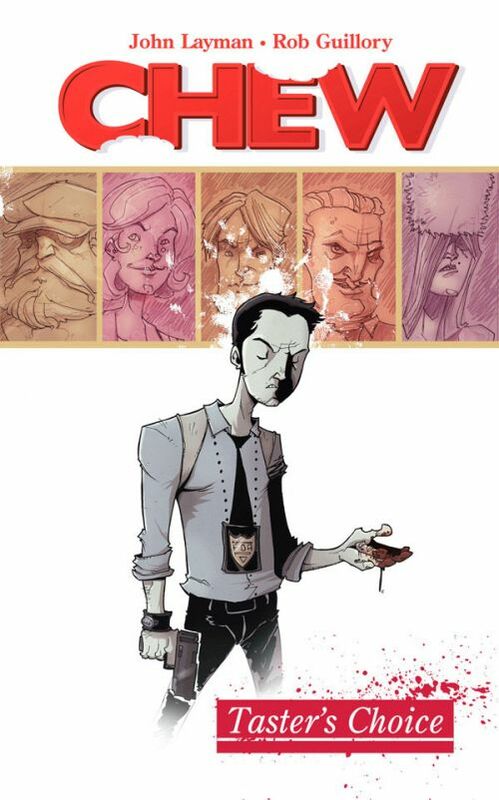 I’ve heard a synopsis or two for John Layman and Rob Guillory’s ‘Chew’ and was always intrigued; after reading the above blurb and tell me you aren’t the same? So finally I got around to buying the first volume: Taster’s Choice and feel like I have struck comic gold! The story follows Tony Chu, a recent addition to the Special Crimes Division of the FDA, who is tasked with solving some of their most unusual crimes. Where my real interest peaked and what drew me in was the overarching story element of Tony’s world; chicken is banned. I don’t know why I find it so interesting, maybe it’s the hilarious comparisons to drug dealing, my vegetarianism or perhaps the feeling that while, ridiculous, something similar is not implausible in real life. I feel this sense of plausibility is the strength of the book; unlike the protagonists in most comics I read, Tony is not a superhero tasked with saving all mankind, he is just a regular dude. He has aspirations, annoying co-workers and best friends just like any of us except he has an unusual ability. Don’t get me wrong I wholeheartedly love superheros but nevertheless Taster’s Choice is a welcome change from the norm all the while presenting its reality it a way that feels not too far from our own. Something else I really enjoyed about the book is how well contained the story is in each chapter. Each chapter is unique and by the end you are left with a very good idea of Tony as a whole. While you are always left satisfied with these unique situations, other elements mean that you get an urge to devour the next as soon as possible. This is probably best compared with experience of watching a great TV series (*cough* Game of Thrones *cough*) and I think is says a lot for Taster’s Choice’s great storytelling and makes for a very enjoyable read. 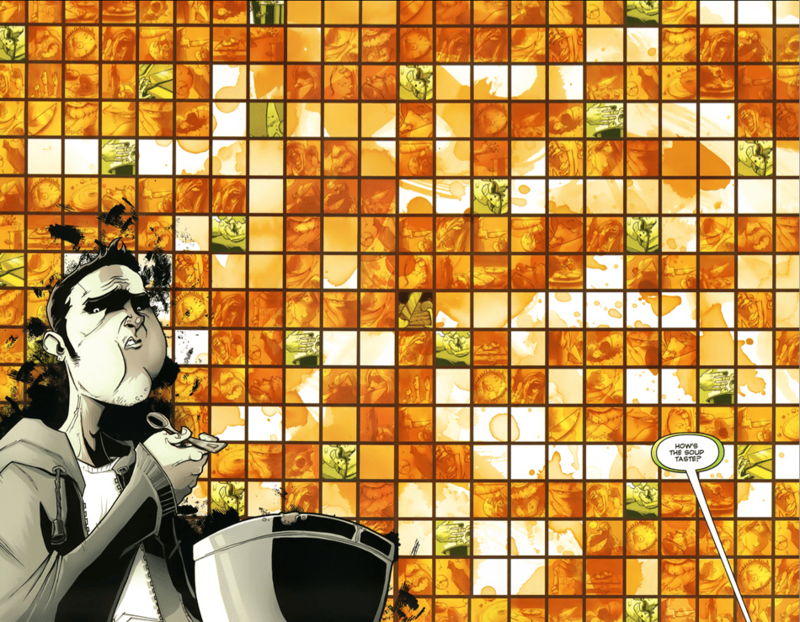 Equally as enjoyable is Rob Guillory’s art. It is the perfect complement to the story; conveying the humour, emotion and often brutal situations that take place. On top of this, the style is so unique that I often found myself admiring what I saw on the page: the characterisations, the staging of each panel and the excitement of action sequences. I’m also thankful, as a somewhat squeamish individual, for the staging of many panels which take the edge of some of its more gruesome moments. It may sound strange given the premise and often the setting, but once I finished reading I couldn’t help but feel charmed by Taster’s Choice and Tony Chu. Actually it’s only when I went to explain it to other people where I realised how dark and gruesome it could be; “they find a finger but they don’t know who it belongs too so he has to eat it.” What’s great is that the story never feels like it is a one trick pony with a silly gimmick that can only take it so far. Twists and turns (often completely unexpected) keep things interesting while every situation and character is kept grounded it a world which feels bizarrely real. Pair this with some of the most unique art I’ve come across and you’ve got excellence; I would recommend this to regular comic readers and first timers alike.